Earlier this month, while Americans were home preparing their Thanksgiving feasts, the mayor of Rome unveiled an archeological site of momentous importance. After six years of excavation work, the “Circus Maximus” was re-opened to the public on November 16, 2016. The Mayor of Rome Virginia Raggi declared, "After 2,800 years of events, today the treasures of Circus Maximus will be finally revealed to envelope citizens and tourists in timeless splendor." The arena was built between two of Rome’s infamous seven hills, the Palantine and the Aventine. And like the name implies, the site is of grand proportions. In fact, it is the largest sports stadium ever built, with the capacity to seat over 380,000 spectators. That’s nearly four times larger than the largest modern sports stadium built today. "For the first time, the archaeological area of antiquity's biggest spectacle structure is open to the public," the city of Rome released in a statement. Mayor Raggi proudly announced, “It's important to have given the city back such a precious area, which has been subject to restoration since 2009." Years of excavation work has produced many clues as to the use of the grand arena. The oldest building, constructed in the VII century B.C. by Tarquinius Priscus, was made of wood, but in its moment of splendor, Circus Maximus was likely completely covered in marble and travertine stone, much like the Coliseum. In the center of the track were two large Egyptian obelisks, one of which can now be found in Piazza del Popolo. Chariot racing became the most important spectacle to be held at Circus Maximus. Not unlike today’s sporting events, in which spectators ate, drank, and bet on the winner, the races gained importance not only in sport but also in cultural and political realms. The four teams, or factions, that took part in each race were so popular they ended up becoming political parties. Each with an identifying color, the faction’s drivers were bought and sold to others teams, much like today’s top athletes. Prices were equally as impressive, with large sums of money and prizes awarded to the winning team. As in Roman times, Circus Maximus is still used to host events and concerts today. 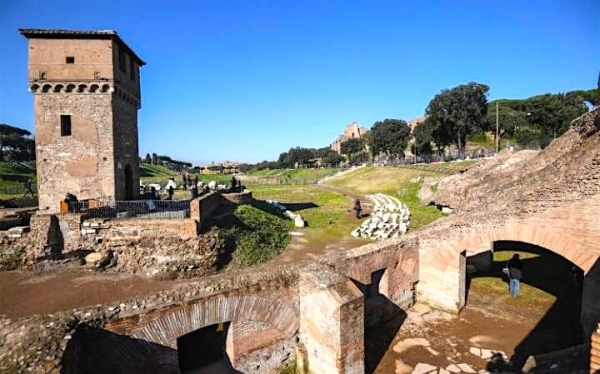 Whether you have already seen the Coliseum, Vatican and Roman Forum up close, or you are planning your first trip to the Eternal City, the newly unveiled Circus Maximus is a site to see. Allow us to arrange a private visit, escorted by a Licensed Historic Guide, to recount the arena’s highlights in real time. For your next customized luxury trip to Italy, contact the Italian Concierge for your insider’s guide to Italy’s treasures.